Are you looking for Hornet Removal in NJ? ALCO Animal & Pest Control offers prompt, professional and safe Hornet Removal in NJ since 1995 for many satisfied clients. Whether it is residential or commercial Hornet Removal , ALCO Animal & Pest Control will solve your Hornet problem in no time. Our trained and experienced Hornet Removal technicians are qualified to handle a variety of Hornet situations. ALCO Animal & Pest Control will keep you safe and keep you in line with state and local animal laws. ALCO Animal & Pest Control uses environmentally friendly Hornet Removal products as well as humane Hornet Removal methods to keep you and your children safe while performing the Hornet Removal job. Our knowledgeable pest technician will answer any questions you may have and explain to you every detail you need or want to know about the job. We are always friendly and we are here to help you get rid of Hornets. Identification: Hornets have an elongated thick body, long antennae, and wings about the size of their body length. While many are black-bodied near the head and yellow toward the rear, others have more of a reddish hue instead of black. This yellow and black combination makes them easily confused with yellow jackets, despite being considerably less aggressive. Their stinger is relatively small, but still powerful, and their wings are partially translucent and range in hue from red to grey to amber. The queen is the largest member of the hornet colony. European hornets are not as aggressive as bald-faced hornets, but will nevertheless sting if their colony is disturbed. European hornets tend to make their nests in secluded, above ground locations such hollow trees, attics, porches and inside wall voids. Identification: Bald-faced hornets are characterized by the ivory white markings across their faces, thorax, legs, and abdomens. The queen and her offspring range in size from 13 to 20 millimeters with the queen being the largest in the nest. Hornet nests are constructed with paper-like material produced by the hornets mixing their saliva together with the wood fibers they gather. 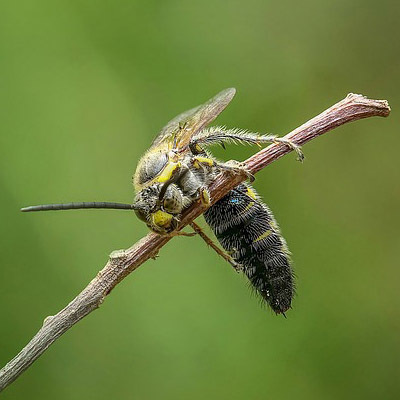 During the time that nests are being built, it is common to see hornets scraping away a thin layer of wood from a wooden fence, an old log or the side of an unpainted wooden building. The progression of the season will bring about 100 to 400 workers in the nest. These are often found in shrubbery and bushes, as well as attached to man-made structures like houses or commercial structures. These nests are usually gray and can be anywhere from 18 inches wide and 24 inches tall and up. Air vents are located at the top of the nest, allowing air in, but not other elements.